The first revenue numbers for legal sports betting in Rhode Island are just over a million dollars in the first six weeks. The state will get fifty-one percent of that, after operating expenses. Revenue estimates predicted the state making nearly 12 million dollars by this summer, so that’s a little low, if you’re looking at monthly averages. But state Department of Revenue Spokesman Paul Grimaldi said sports betting numbers aren’t likely to be similar month over month, as the popularity of betting follows the popularity of certain sports. An uptick was expected in the weeks leading up to the Super Bowl. Grimaldi said the numbers show the interest is there. Currently bets can only be placed in-person at the casinos, but legislation to allow mobile sports betting is already working its way through the General Assembly. Rhode Island kicked off legal sports betting at the end of November at Twin River Casino in Lincoln, with the Tiverton Casino following in December. The state is the only one in New England to all above-board betting on sports. 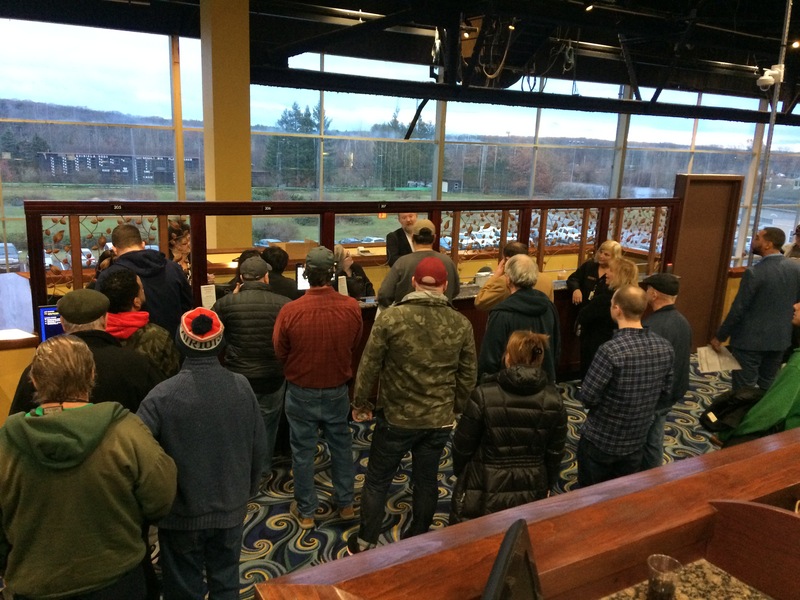 Gamblers waiting to place their first legal bets on sports at Twin River last year.